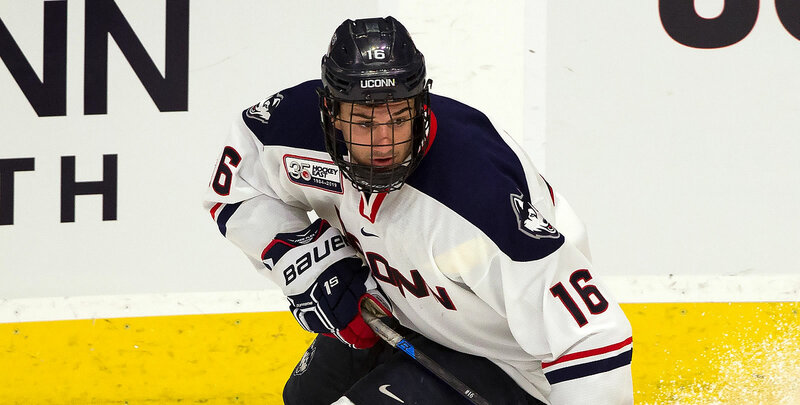 STORRS, Conn. - The Sacred Heart Pioneers scored two special team goals and got a 33 save night from freshman John Benson to deal the UConn Huskies a 2-1 loss Tuesday night in the XL Center. The Huskies lone goal came off the stick of senior Karl El-Mir (Montreal, Quebec). The Huskies drop their final non-conference game of the year and fall to 7-16-2 overall. The Huskies have lost six-straight to the Pioneers and are now winless in their last five-straight. The tale of the game on Tuesday night came down to special teams as the Huskies, who outshot SHU 34-26 overall, came up empty on five power play chances. The Pioneers got a shorthanded goal in the first and scored on the power play in the second to produce all the offense they would need. SHU sophomore Matt Tugnutt picked-up his sixth goal of the season, scoring shorthanded at 3:44 of the first period. At the 8:46 mark of the second, freshman Ryan Steele put the Pioneers up 2-0 with a power play goal. The Huskies ended the shutout bid at 15:27 in the third as El-Mir scored his 12th goal of the season, putting one off a SHU defender and past Benson. The Huskies pulled goaltender Adam Huska (Zvolen, Slovakia) for the final 2:33 but couldn't find the tying goal. The Huskies had three power play chances in the first 20 minutes but it was the Pioneers who took advantage on special teams with a shorthanded goal at 3:44. SHU broke the puck out up the right boards with Tugnutt catching the UConn defense off guard to create a two on one chance. Tugnutt broke in on Huska and put one bar-down, stick side for a his sixth on the year and a 1-0 lead. Special teams gave the Pioneers their second goal on the night as they scored on their third power play chance to take a 2-0 lead at 8:46. SHU cycled the puck to Jordan Kaplan at the point who blasted a slap shot on goal. Steele was set up in the slot and was able to get a tip and redirect it past Huska for his seventh on the season. UConn finally cracked the scoring column at 15:27 as El-Mir picked-up his 12th goal of the season. The senior took a pass from freshman Jachym Kondelik (Budejovice, Czech Republic) and carried into the zone. He broke to the net and threw the puck on net, getting a deflection off a SHU skate and into an empty net to cut the lead in half, 2-1. The Huskies pulled Huska with 2:33 left in the period and kept puck possession in the zone for much of that time. UConn got five shot attempts off but Benson picked-up his final three saves down the stretch to seal away the win. The Huskies return to Hockey East action hosting the Boston College Eagles on Friday night at the XL Center. Game time is at 7:05 pm and the game is available across Connecticut on CW20.